The good news? 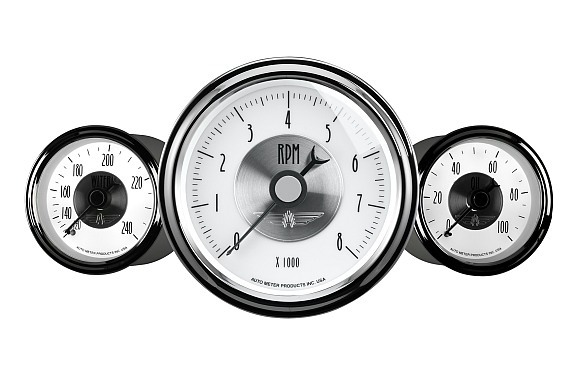 Now I know what gauges I want for my 1963 Falcon Wagon project! I knew I’d update what was in my old long roof, but hadn’t decided what would work best until I saw these. I’ll see them first hand at 2013 SEMA Show and report back if they’re as pretty in person as they are here in pictures! Here’s more info in the official press release below… read on! October 1, 2013, Sycamore, IL – Auto Meter’s newest addition to the highly successful Prestige series join the nostalgia-inspired Black Diamond and Antique Ivory designs offering a pure white dial colorway for greater design possibilities when planning your build’s interior. Auto Meter Prestige Pearl instruments are proudly built in the USA, featuring hybrid dials highlighted by embossed spun aluminum accents, traditional arrow-styled pointers and are finished with period correct domed lenses and chrome bezels. The beauty of these instruments is more than skin deep, at their heart are the same performance meter movements found in race cars across the country derived from Auto Meter’s nearly 60 years of racing instrument know how and illuminated by Auto Meter’s most advanced full-face LED lighting, Prestige Pearl gauges provide unmatched night time visibility ensuring you’ll always know exactly how your vehicle in running, whether it’s on cruise night or a cross country road trip. 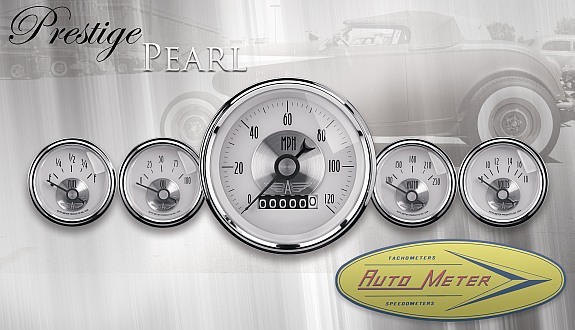 Get more information and pricing on Prestige Pearl Gauges here. Contact Auto Meter toll free at 866-248-6356 to discuss your project and visit them on the web at www.autometer.com! does the speedo come in 5 inch?